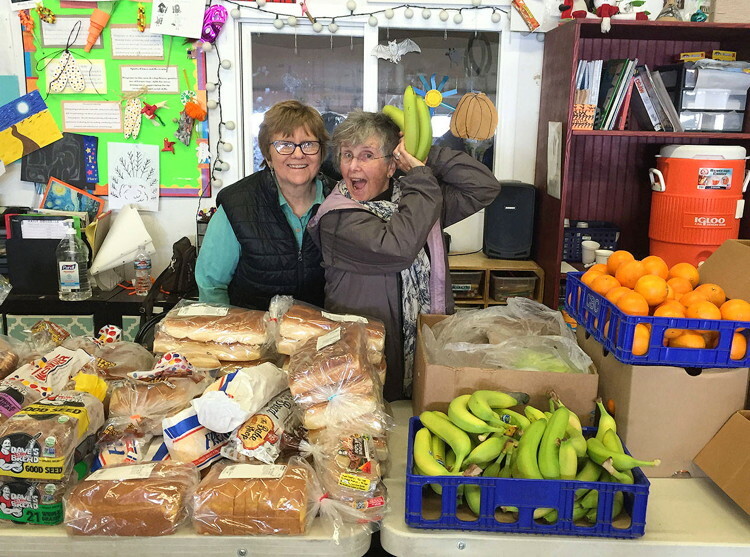 Judy Smith and Anni Campbell volunteer at Gifts from the Heart Food Bank, which is celebrating its 16th birthday on 14 February, 2018. Photo provided by Molly Hughes. Clients at Gifts at the Heart Food Bank will be in for a rare sweet treat to celebrate the coincidence of two holidays falling on the same day. Today marks not only Valentine's Day but also the food bank's Sweet 16 birthday. It also happens to be on one of the organization's distribution days, which only occur on the second and fourth Wednesdays of the month. "I just thought it was funny that we'd be open on Valentine's Day and it's our real sweet 16," said Molly Hughes, president of Gifts from the Heart and Coupeville mayor. Ken Hofkamp, food bank board member and owner of Prairie Center Red Apple, purchased 100 bags of candy and Hughes placed notes on each one that read,"Gifts from the Heart Food Bank is Sweet 16 today! Happy Birthday to us and Happy Valentine's Day to You!" In 16 years, the food bank has gone from serving one person its first distribution day to between 85 and 95 families each time, said Hughes. The group started in the lobby of "the brown house" on Main Street in Coupeville, went to "literally a closet" in Greenbank, then an unused walk-in refrigerator to their current location at the old Coupeville fire station, she said. Hughes said as the anniversary approached she started reminiscing about the food bank's history. Hughes became involved when she saw an advertisement in the newspaper that a group of volunteers would be distributing food on Valentine's Day in 2002. She stopped by to help and kept volunteering with the group from that day on, she said. As more people starting coming to receive food, the group was told they had to find another location. "We became a little disruptive," said Hughes. Eventually, the growing operation was allowed to set up shop twice a month at the fire station at the time at 203 N. Main St.
Hughes remembers setting up tables and food behind the fire trucks and having to rush everything out of the way when the fire alarm went off. When the fire district changed locations, she said the fire chief at the time, Joe Biller, was to credit for allowing the food bank to stay. "He was really instrumental in getting the fire commissioners to agree to let us rent the old fire station," she said. Hughes credited a number people for keeping Gifts from the Heart open, including the approximately 40 consistent volunteers, about 10 of which she said have been with the group its entire 16 years of existence. She also acknowledged the importance of all the donors and organizations that hold large food drives every year as a factor in its success. "It takes an army to get all this done" she said. 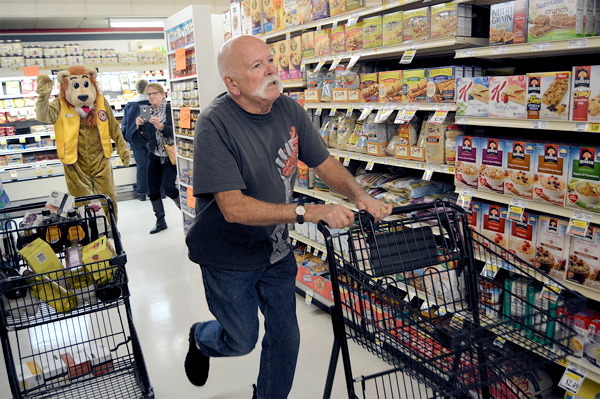 Many local businesses regularly contribute to the food bank's supply. Different businesses and members of the community have made programs such as Meals 2 Kids, which sends Coupeville Elementary School students who are in need home with food for the weekend, possible, she said. "We just have such a wonderful community," Hughes said. "It's their consistent food drives and consistent donors that get us through year after year." Click for original article in Coupeville Examiner. 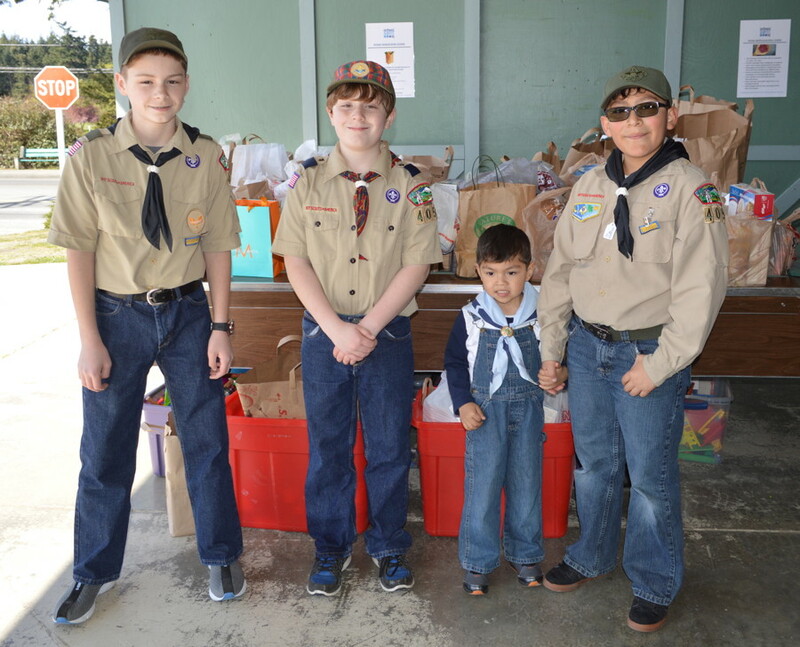 On Saturday, April 15th, 2017 the Coupeville Cub Scouts and Coupeville Boy Scouts conducted their annual Scouting for Food drive. 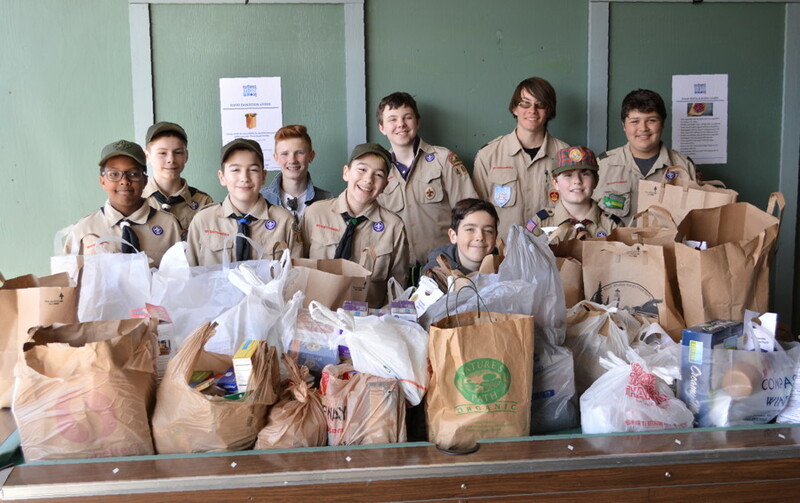 The Scouts collected numerous bags of food, which they donated to GFTH to help fill our shelves. Thank you to this great group of Scouts, their leaders, and the Coupeville community for another successful drive! 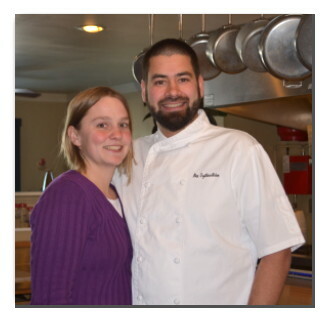 Sara and Tyler Hansen, owners of the Oystercatcher Restaurant in Coupeville, donate freshly-baked bread every week to the Meals 2 Kids program. Because of their generosity, the weekend bags now include a half loaf of Oystercatcher’s delicious bread for each child. What a welcome and healthy bonus for all! In addition, The Oystercatcher regularly donates bread for our clients on distribution days. Did you know that Knead & Feed and Lavendar Wind have been donating baked goods to the food bank once a week for years? The next time you visit Knead & Feed or Lavendar Wind, thank them for their donation and don't forget to support your local businesses that support the food bank. 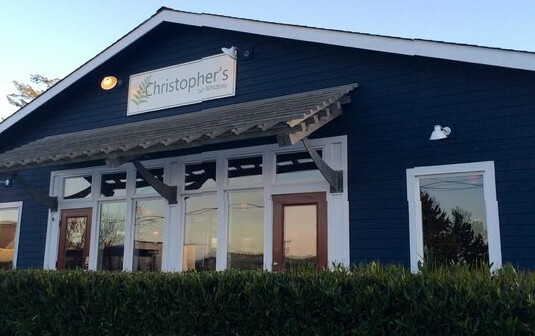 On March 28th, Andreas and Lisa Wuzrainer, owners of Christopher’s, and John Tristao of the musical group "Johnny Bulldog" partnered to organize another fabulous fundraiser for our Meals 2 Kids program. Andreas donated 100% of the full four-course meal and paid his staff to work on their night off; the staff donated their tips; and John and his band donated the music. Thanks to their generosity, the entire price of the event tickets went directly to the Meals2Kids program! Many thanks go out to all those involved in making this evening a success along with all those who attended to support our community food bank and this important program! At the 2017 Coupeville Chamber of Commerce annual Excellence Awards, the Gift From The Heart Food Bank was chosen as the nonprofit of the year. We were recognized for the 15 years of service we have provided to our community and those in need. Both the food bank and our Meals 2 Kids school program were recognized. The Chamber noted that we do our work quietly, without a lot of fanfare, and we had been nominated for flying under the radar for so long. Congratulations to each and every one of you who keeps our programs running, week in and week out. You are all so dedicated and committed to the jobs you do. We could not do it without your faithful service. Thank you! 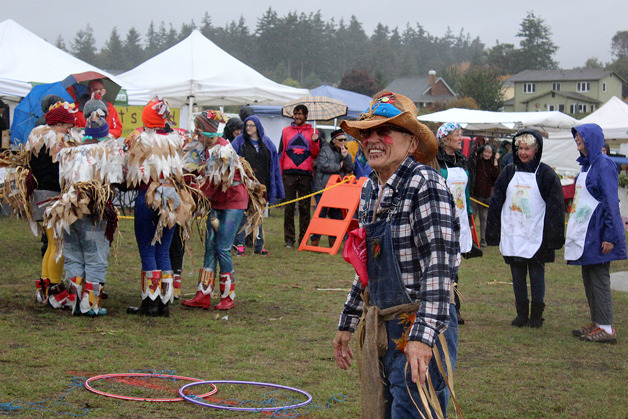 Heavy rains didn’t damper the fun at HarvestFest Saturday. The annual event, which took place from 10 a.m. to 2 p.m. at the Coupeville Farmers Market, is a fundraiser for Coupeville’s Gifts from the Heart Food Bank, a nonprofit, all-volunteer organization. "It is a quarter of our annual budget. This fundraiser is a huge deal for us," said Mayor Molly Hughes, festival organizer and food bank board president. "It’s very important for our operations." 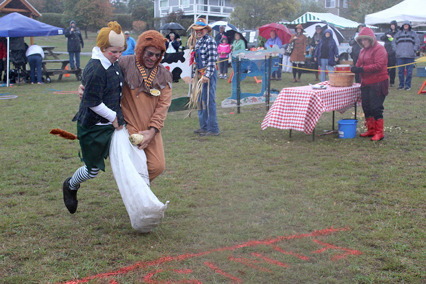 Despite a steady downpour, six teams turned out donning full costume and makeup to participate in the festival relay races, the festival’s primary fundraising function. The teams and their respective organizations were the Crop Dusters representing the Coupeville Town Council; Big Red and the Egg-cellent Chickens representing Rosehip Farm and Garden; Friends of Dorothy representing the Gifts from the Heart Food Bank; the Scarlet Runners representing Kettles Farms; the Lady Lions Plus One representing the Coupeville Lions Club; and the Captain Whidbeys representing the Coupeville High School Drama Club. The Captain Whidbeys were sponsored by the Coupeville Historic Waterfront Association and challenged with raising $2,500. The association and affiliated businesses helped them to raise the money and matched the donations the students collected. The team altogether raised over $3,000, more than $400 of which the students raised themselves. The team also won the People’s Choice Award following the relay. Rosehip Farm and Garden took the prize for most funds raised, with the drama club tailing behind by just $20. Rosehip also won for fastest relay time. Hughes expressed her gratitude for all the dedicated volunteers and ever-enthusiastic relay teams who show up year after year, rain or shine. “I am so thankful for those teams that continue to come out in that bad weather,” she said, adding that they not only show up, but consistently come decked in some spectacular costumes. Poor weather has been a negative factor for the festival in recent years, and while teams and volunteers are willing to brave the wet and wind, many prospective market-goers are not. "The first six years we had beautiful weather," Hughes said. “The last three years it couldn’t have been nastier." For this reason, next year’s 10th annual festival will likely be moved to an earlier date. "I am 90 percent sure we will be changing the date next year," Hughes said. Despite the rain, altogether $15,644 was raised this year. "We’re going to be 15 on Valentine’s Day and we’re only here by the generous support of our community," Hughes said. "We really appreciate it." Safeway of Oak Harbor, in partnership with NW Harvest, again held a food drive for us from November through December 2017. Each $10 bag contained ten items including peanut butter, pasta, macaroni and cheese, as well as cans of tuna, green beans, corn, soup and fruit. Tom Rusnak of Coupeville raced through Prairie Center Red Apple with speed and determination Saturday. The rules were simple: Grab as much as you can in three minutes; only grab up to three of a single item; no meat and no alcohol. Rusnak was the lucky winner of the Coupeville Lions Club annual Shopping Spree. Roughly $1,800 in tickets were sold and in those three minutes, Rusnak managed to grab nearly $750 in food items from about half the store. “Three minutes went fast,” he said. “I thought I’d get farther.” While Rusnak can keep all of the items from the spree, he opted to donate part of his haul to Gifts From the Heart foodbank. Lion Penny Barville said Rusnak’s haul was the largest to date. After paying his tab with funds from ticket sales, the Lions donate all remaining proceeds from the raffle to the food bank as well. This FREE breakfast and lunch program was a partnership between GFTH, Coupeville Boys and Girls Club, Food Lifeline, and the USDA. In the spring, Food Lifeline contacted me to see if we wanted to be a part of this program. USDA pays for it, and Food Lifeline organizes it. This is the same free lunch program that the south end has had for three years and Spin Cafe in Oak Harbor ran for the second summer. Food Lifeline provides the food, delivers it to us once a week, and provides all the marketing material. We just had to come up with the volunteers to run it. How could I say "no" to this offer? There has been a "feeling" in the community that we needed a summer meals program; this was a chance for us to test for that need. Food Lifeline is also trying to establish some partnerships with Boys and Girls Clubs; however, they didn't even know we had a Club in Coupeville when they contacted me. From the beginning, I wanted to develop an entirely new group of volunteers to run this program; I didn't want to ask the current food bank volunteers to take on yet another program, and the Boys and Girls Club did not have the staff to organize it. Free breakfasts and lunches are provided to anyone 18 years and younger who show up and want them. They don't have to be food bank clients or B&G Club members. No proof of income is needed. All meals are delivered in individual sacks preassembled by Food Lifeline. Breakfasts are shelf-stable sacks consisting of milk, cereal and fruit. Lunch sacks contain fresh food and have five of the following types of items: milk, juice, string cheese, yogurt, carrots, oranges, apples, dried fruit, fruit cups, tuna, peanut butter and jelly sandwich, crackers, hard boiled eggs, etc. Food Lifeline also provides additional shelf-stable lunch sacks for backup. All meals meet the USDA's nutrition requirements. The program includes a "share bin" where kids can leave any food they won't eat and other kids can take what they want if they are still hungry. Leftover food is being used by the B&G Club for snacks. I love a program that doesn't waste food! This program ran the entire 11 weeks of summer. During the first week we fed most of the B&G Club summer camp kids every day, but the program was open to everyone. We served breakfast at the food bank every day (8:00-8:30) and lunch there as well, except on Wednesdays when we served in Coupeville Town Park (noon-1:00). We sent postcards with program information home with every school kid the last week of school. We had posters around town. We had a great write-up in the paper asking for volunteers and talking about the program. We put up a sandwich board outside of the food bank when we were serving. I worked with the newspaper to run another article. We got a good response for new volunteers from the newspaper article, and I also contacted several churches and service groups who jumped in to help. Needless to say, figuring out the schedule for two volunteers for breakfast and two volunteers for lunch every single day was the most time-consuming part of trying to get this program up and running in such a short time. We had a group of 22 volunteers show up for a training session along with all four of the B&G Club staff. Our GFTH Board Member, Ken Hofkamp, donated a refrigerator to us to store the fresh meals. The Soroptimists, Coupeville United Methodist Church, the Coupeville Lions, and the Parker Road Walking Group each volunteered to take a week of meal service. Some of the GFTH regulars found out about the program and also volunteered. We struggled with space to store all of the food supplies, such as the boxes of shelf stable meals, but slowly figured it out. Because the program is paid for by the government, there are rules to follow and reports to complete. This being our first year, we had a lot to do in a little time, but we pulled together to make the program a success. Results from first week: We served 60 breakfasts and 120 lunches! This included two breakfasts and 16 lunches to community kids. We even had a surprise inspection from Food Lifeline and passed with flying colors. Thrivent Financial for Lutherans, Central Snohomish Branch, awarded a $1,600 grant to GFTH this fall. As a result of this grant from Thrivent, GFTH volunteers Carol and Darrell Dyer were able to purchase 1776 cans of fruit for our clients at the Fred Meyers store in Burlington, who in turn gave the food bank a discount on this much needed purchase. Thanks again go to these donors and volunteers whose generosity and hard work make such a positive impact on our efforts to provide healthy food for our clients.